If there are two things I love about baseball, it’s extra innings and walk-offs! Today’s “AROD’s Most Memorable” has them both. 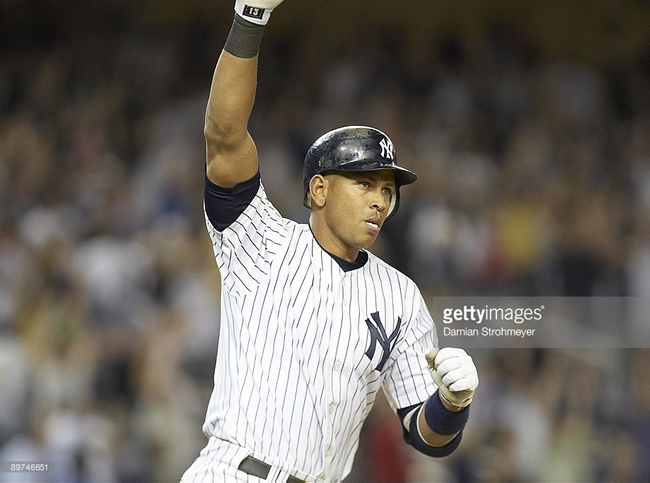 Let’s talk about the time Alex Rodriguez sent everyone home (and pretty much sealed up the Eastern division) by breaking a 0-0 tie in the bottom of the 15th inning against the Red Sox at the Stadium. OK I kind of lied about something. There are three things I really love about baseball. The third, is when the Yankees beat the Red Sox. I know it’s happened less this year than we’d normally like, but traditionally, this is something that has happened a lot, and I’ve loved it every time. I like it even more when the playoffs are on the line. Really, I just like when Sox fans get sad. Because they despise AROD so much–seriously, the lustiness in their booing is palpable at times–it’s even better when AROD makes them sad. Imagine if a single game had all of these things in it combined? Well, imagine no more. Let’s flash back to Friday, August 7, 2009. The Red Sox were in town for a four-game series that had huge playoff implications. Coming into the series, the Yankees held a 3.5 game lead on the Sox, and had extended it to 4.5 with a 13-6 walloping on Thursday night. However, if the Sox could win the next three, they’d be just 1.5 games out with almost two full months to go in the season. This meant Game 2 of the series was a very important game, not just for this particular series, but for the fate of the division as well. Luckily for Sox fans, the pitching match up was a favorable one for Boston, as they had ace Josh Beckett on the hill and the Yankees countered with the much-maligned A.J. Burnett. The former Marlins teammates made it clear that this would be a pitcher’s duel from the beginning, putting up zero after zero after zero on the scoreboard as the game rolled on. Burnett walked six, but only allowed one hit, which kept the Sox off the scoreboard in his 7.2 innings of work. Beckett, meanwhile matched him nearly pitch for pitch, putting up seven scoreless innings before giving way to his bullpen. Not to be outdone, both bullpens kept the shutout party going for just as long as the starters had. The Sox bullpen–Hideki Okajima, Daniel Bard, Ramon Ramirez, Jonathan Papelbon, Manny Delcarmen, Takashi Saito and Junichi Tazawa–held the Yankees scoreless seven innings, all the way through the bottom of the 14th. The Yankees bullpen meanwhile, was just as good. Phil Hughes, Mariano Rivera, Alfredo Aceves, Brian Bruney and Phil Coke pitched in to shut the Sox out for 7.1 scoreless of their own to send the game to the bottom of the 15th. Unfortunately, something had to give, and somebody had to win. Despite the fact that he’d almost lost the game in the bottom of the 14th–Melky Cabrera hit a liner down the right field line with the bases loaded that went foul by maybe four inches–the Sox stuck with Tazawa for the 15th. I can’t say I blame them. The kid was having a good season to that point, and you can’t go crazy taking pitchers out when it’s 0-0 in the 15th. After Melky’s hit went foul, it felt like this game might go 20 innings. Fortunately, it wouldn’t go much longer. Derek Jeter got the party started with a leadoff single. After Johnny Damon popped out to first base on a bunt attempt, Tazawa tightened his grip on the Yankees by striking out Mark Teixeira. Just like that, a promising rally seemed doomed, as the Yankees now would need a big two-out hit to win the game. In stepped Alex. Up until that at bat, it had been a quiet evening for the star third baseman. He had struck out looking in the top of the second, flied out in the fourth, grounded out in the sixth, bounced an infield single to short in the ninth (he stole second, but was stranded), struck out again in the 11th and flied out again in the 14th. Overall, he had one dribbling single in six at bats–not the best evening by any stretch. Of course, that would all change. Alex got ahead of Tazawa two balls and one strike and, at 12:42 AM, five hours and 33 minutes after the first pitch, sent everybody home for the night with a 408-foot bomb into the bullpen in left-center.